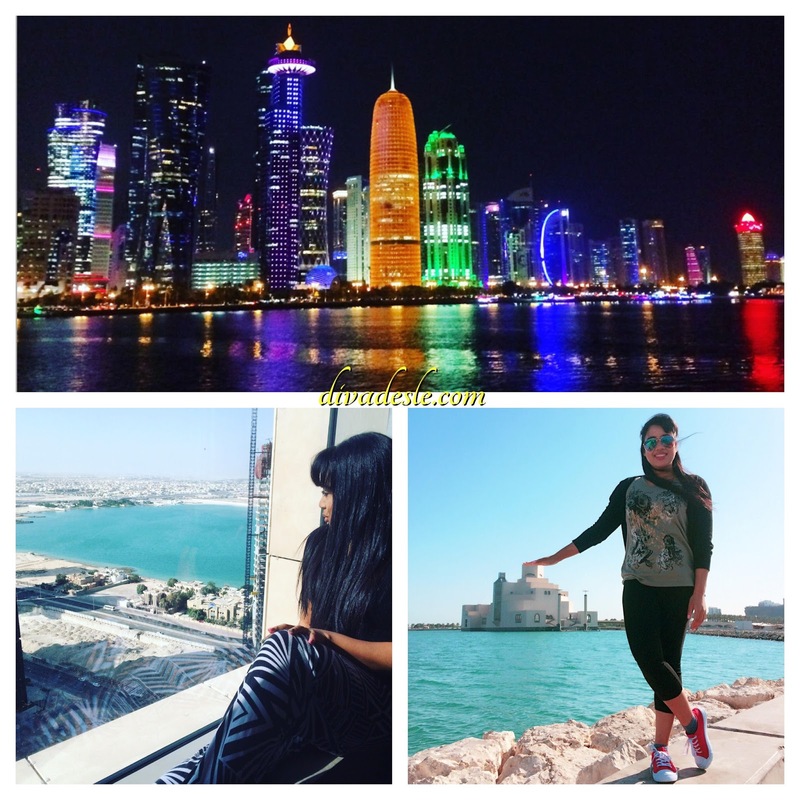 My 10th Trip to Qatar! It feels like ages since I sat down to right a blog post. 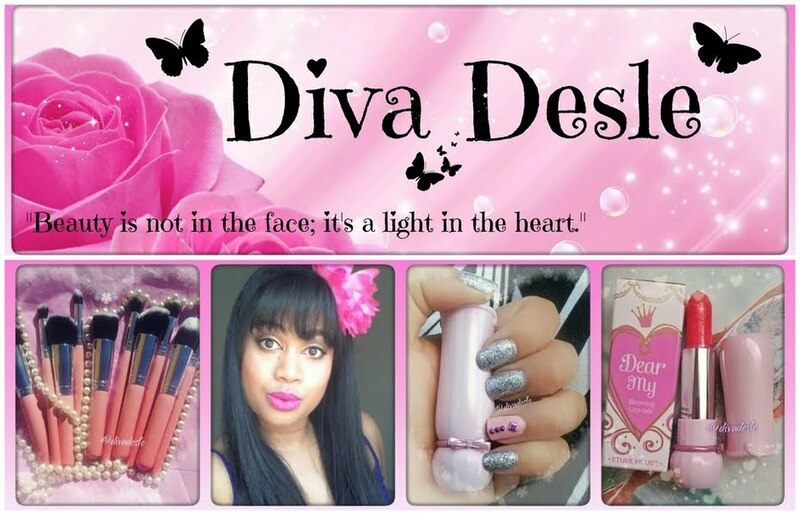 I have been so busy lately and literally all over the place that I had no time for Diva Desle. 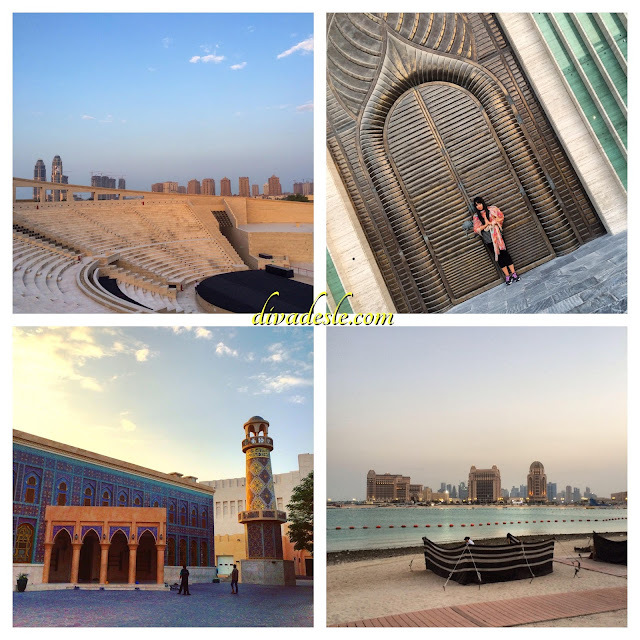 I recently came back from my 10th trip to Qatar. I cannot believe that I have been to the Middle East 10 times in the last four years. It actually feels so surreal. I remember the very first time I flew overseas in 2013. I was so nervous and excited, not knowing what would await me. Fast forward to 2017 and I still get butterflies whenever I fly to the Arabian Gulf. This was truly one of the best trips I have ever been on. It was so magical and I have made long lasting memories. To start off my boss gifted me with a gorgeous hotel suite looking over panoramic sea views. My hotel room was a dream come true and I still fantasize about laying on that King size bed watching the sunset through my window. The crew that I traveled with was the best travel buddies I could ever ask for. We had so much fun and went on so many crazy adventures together. I saw and experienced places and moments that I have never felt or seen before. I want to share some of my highlights with you. Just so you know, I did go there to work, so it was not all fun and games, LOL. Katara is one of the must-see attractions within Doha. It is a cultural centre that celebrates Middle Eastern art, music, literature and history. From glorious Islamic architecture to a magnificent amphitheatre that overlooks the gorgeous city, this place is not to be missed. Your soul will be richly blessed by the skillful fine art on display and take in the glorious well-crafted buildings. You can also take a walk along the beach and enjoy the delicious Arabian cuisine at many of the restaurants and cafes there. When my crew and I went, we managed to catch the sunset and take in the beauty as it was getting dark. We relaxed along the beach with a cup of Karak (Qatari Tea) to end off the day. On my last day in Doha, we visited the famous MIA. 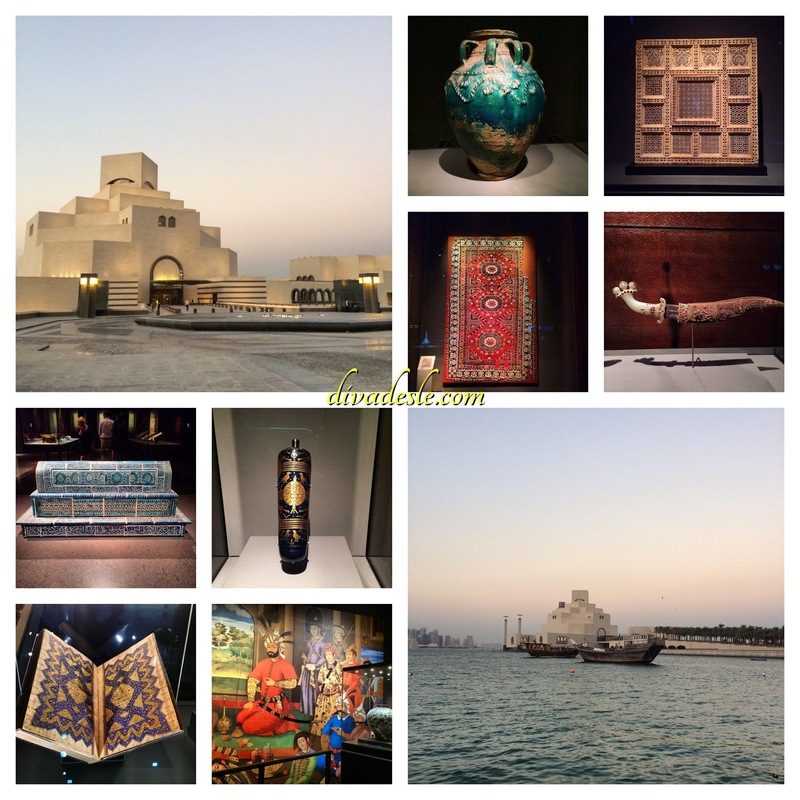 This museum is housed in a beautiful building overlooking the Corniche (Doha Bay). The museum is filled with Middle Eastern and Asian art, historical artifacts and spiritual texts dating back over 1400 years. This gorgeous place totally blew my mind away. I learnt so much about Middle Eastern history and art. There are so many beautiful ancient art pieces that really gets you thinking. How did they create such skillful exquisite pieces of pottery, tapestry and tools with the limited resources they had? It truly boggles the mind when you see the beauty that the ancient world created. There are four floors to explore so you have to go early in order to take in all the museum has to offer. Unfortunately, I did not get to see everything as I was flying home that very night. I definitely want to go back to finish what I started. If you follow me on Instagram (divadesle), you would have seen all the camel love I was receiving. This trip was definitely all about the camels. These wonderful animals are really a site to see. They are huge, have the most diverse personalities and are so super intelligent. We managed to bond with them at the famous Souq Waqif ( Qatari market). We were even present at the camel's dinner table. They chowed down on some strange looking hay while we took photos. I had the most amazing time and I thank God, every day for the many blessings and opportunities that have come my way. This trip was truly unforgettable and I loved every moment of it. I am happy to be home for the festive season though. As you know home is where the heart is and my heart is definitely in Cape Town, South Africa! 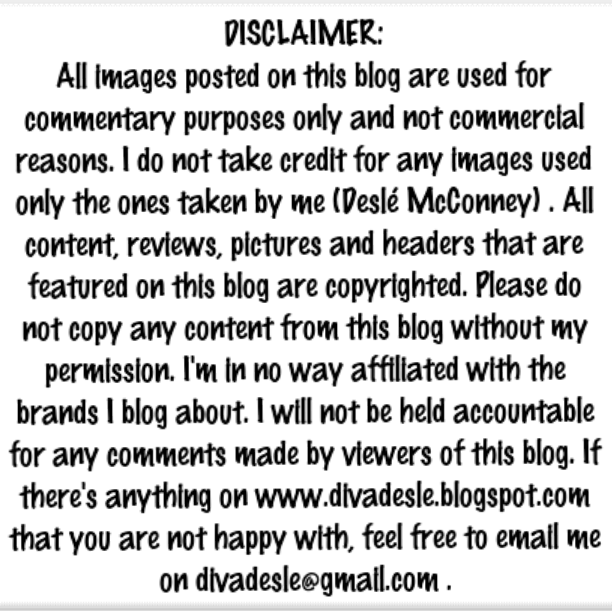 Thank you so much for reading and for being apart of the Diva Desle craziness. 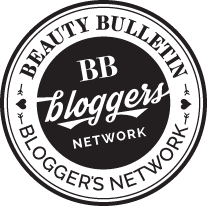 I appreciate each and every one of you who supports this little blog of mine. I want to take this opportunity to say a BIG THANK YOU from the bottom of my heart. Happy New Year Desle! I always enjoy hearing about your adventures in Qatar! I love learning about the history of both places & people. What a glorious place. You have the nicest boss! What a fabulous view. Hope you had an amazing holiday. Hope you had a wonderfully happy Christmas and a joyful festive season. And, may you have a super blessed, joyful, peaceful, prosperous new year; filled with love and favour for you. Your life is amazing!!! Love the views and images and I'm glad that you can enjoy such pleasure while working. Lucky girl!